17-year old Miclen LaiPang started his first violin lesson at the age of 3 due to the influence of his older brother who is now a professional first violinist of the Malaysian Philharmonic Orchestra. Miclen performed his first recital when he was 4 years old. Some of his accomplishments are winning the audition to be the fiddler for the play “Fiddler on the Roof’ for the Yucaipa Little Theater in September 2007. Due to earning the highest points for both piano and violin during the Certificate of Merit music examinations from 2005 to 2008, he was selected to perform at the MTAC Convention held in Northern and Southern California. At age 8, he was the grand-prize winner of the Merit Award audition for the University of Redlands Community School of Music; also won 1st place in the American String Teachers Association Competition when he was 9 years old. At the age of 10, he was awarded the Caroline S. Pike Scholarship for winning the Redlands Bowl Annual Young Artist Audition in 2006. Miclen was a scholarship recipient of the Young Musicians Foundation in which he performed with the YMF/Balmat National Orchestra at Mt. Rushmore, SD in 2007. He appeared as a soloist in 2007 with the San Fernando Valley Symphony as a result of being the first-place winner of the concerto competition by the SFV Music Teachers’ Association of California in 2008. He performed as a soloist with the Southern Adventist University Orchestra as a result of winning the SAU concerto competition in Tennessee in 2009. 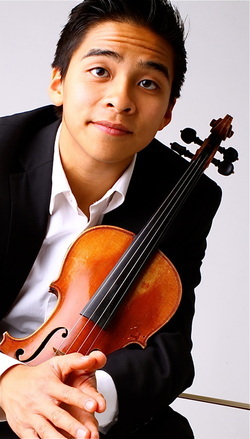 As a winner of the 2008-Claremont Young Musicians Orchestra (CYMO) concerto competition, he performed as a soloist with the orchestra the 3rd movement of Mendelssohn Concerto in 2009. In 2011, he performed the movement of Tchaikovsky Concerto with CYMO as a result of being a winner the second-time around. In July 2010, Miclen was invited to play all 3 movements of the Mendelssohn Concerto at the Redlands Bowl with the Redlands Symphony under the baton of Maestro Frank Fetta. He performed for the 2011 Pasadena Showcase House of Design luncheon meeting, representing Colburn School of Music. He has performed extensively both in the US and abroad. He concertized in Sydney, Australia, when he was 11 years old; toured in Europe and Jamaica as a guest soloist with the New England Symphonic Ensemble in 2009. Among many of his prestigious performance experiences was performing at the Crystal Cathedral, Walt Disney Concert Hall and in Carnegie Hall & for the Indonesian Ambassador to the US and the Indonesian’s Consulate General in the US. Miclen was televised on NBC on July 2009 as one of the top winners for the America’s Got Talent. He appears regularly as a violin soloist on religious television networks, such as 3ABN, LLBN and Hope Channel. He was selected to perform before 70,000 people for the 58th and 59th World-wide General Conference Sessions of Seventh-day Adventists held in St. Louis, MI in 2005, and in Atlanta, GA in 2010, respectively. Presently, he is the concertmaster of the Claremont Young Musician Orchestra, the International Praise Strings, and principal 2nd of the Loma Linda University Church Orchestra. He played as 1st violinist of the string quartet by Colbum Chamber Music Institute, which is being coached by Alice Schoenfeld. Miclen’s past experience was being the concertmaster of the Colbum String Ensemble, Loma Linda University Youth Orchestra, and the Loma Linda Youth Musicians Ensemble. Besides being a violinist, he also plays the piano and guitar. He sings in the Loma Linda University Sanctuary Choir on Saturdays, and is a member of the Redlands Adventist Academy bell choir named Bellissimo. In June 2012, Miclen was invited to be the concertmaster and a violin soloist for the New England Symphonic Ensemble to perform at Carnegie Hall and a tour to South Africa, performing all three movements of the Tchaikovsky Concerto. As a scholarship recipient, he was selected to attend the Castleman String Quartet Program at the University of Colorado in Boulder for the month of July 2012. In March 2013, he has been invited to perform in the Philippines and Malaysia; performing in July 2013, the Stradivarius International Violin Competition, and in August 2013 for the International Concerto Competition in Hong Kong. Most recently, he performed his own arrangement of the National Anthem at a recent Lakers game on December 18, 2012, at the Staples Center. He has been a student of Colburn School of Music since he was 6 years of age. In 2008 and 2010. he attended the Montecito Summer Music Festival in Santa Barbara and participated in the master class of Aaron Rosand. His past teachers include Margaret Shirnizu, Lyndon Johnston Taylor, Linda Rose, Ruggiero Ricci and Chan Ho Yun. Currently, he is a scholarship student of Colburn School of Music under the tutelage of Alice Schoenfeld for private and chamber lessons. After 10 years of being in home school, Miclen is now a regular 12th-grade student of Redlands Adventist Academy. He resides in Redlands with his parents, Helen and Michael, and his cockatiel named Paganini.